Awesome guys! Does this mean I will finally be able to get Shorts beer in Oregon? Instead of having my cousin mail me some from Ohio. So what you are really saying is Heineken bought a 19.99% equity stake in Short’s? We haven’t ever worked with or spoken directly to Heineken. Short’s has sold a minority interest to LUSH, Lagunitas US Holdings. While Lagunitas is owned by Heineken, Heineken does not run Lagunitas day to day, and Lagunitas does not have a controlling interest in Short’s. We are certainly not denying the connection, but our partnership is with LUSH. Lagunitas is 100% owned by Heineken. Sellouts, what happened to “Michigan only Michigan forever”? As we’re sure you can understand, a lot can change over the course of 13 years. We’re continuously evolving in order to do what’s right for our employees and community while brewing the best, most creative beers possible. Yeah!!! Can’t wait to be able to buy Short’s here in California! (Now I don’t have to conserve the Huma I have!!) Congrats! I am a huge fan of Lagunitas as any fan of great beer would be. That being said I am sure that my beloved Huma will remain the stalwart brew that I have come to know and love. I have shared that beer all over this country with like minded enthusiasts and will continue to do so as my Ideal of the perfect (in your face) IPA. Thank you for the last 14 years Short’s family, you are heroes to us all. May the Shorts be with you…. Another great craft brewery sells out. Dress it up and call it a “partnership” if you want if you want. But a huge European conglomerate now owns 20% of a company which was formerly owned and operated 100% in Michigan. Hey El – We’re still operating solely in Northern Michigan. Neither Lagunitas or Heineken will have any say in our day to day operations and we’re still considered independent by the Brewers Association. I hope you’ll come visit us soon and see that we’re still then same people working hard to brew mind-blowing beers. I hear what you are saying. Twenty percent with no control. No control does not change the fact that my favorite brewery ever is now partially owned by a mega-brewery. Being partially mega-brewery by itself is not a deal killer. However it begs the question of what’s next. Neither side would enter this partnership expecting the status quo to stay the same. “No control” does not equal no influence. And influence of this type is rarely best for the consumer. It is only natural for Short’s fans to view this deal with suspicion. I personally will wait and see. Anthony, as a beer blogger in Minnesota, I have been back and forth on the Lagunitas/Heineken thing. However after talking to my local Lagunitas rep, I feel this is in line with the Independence that Lagunitas still retains. Also Heineken is family owned. Lagunitas wanted to send their beer around the world, and there is only one way to do that, partner up with the only family owned brewery that has fingers across the globe. Like I said I’m still 50/50 on Lagunitas but these guys are not sell outs, they are just welcoming some help. I got to agree with Mr. Stone on this one. It’s a philosophical issue for me more than anything else. As a long-time supporter of local, craft brewers I prefer to give my money to breweries who retain that profile. Big breweries push out (actual) small breweries in the areas of distribution, retail shelf space, and bar/restaurant tap space and I shudder at the thought that my money (even if it’s only 1/5 of it) goes to support such initiatives. I have been to your brewery and was glad I got a chance to before you made this decision. I loved the Ween homages, the food was good, and the variety of dark beers (it was 10 degrees outside) was excellent. Unfortunately based on your decision to join forces with a mega-brewery I won’t be returning. I agree with El. Larry Bell found success, and still owns 100% of his Michigan based business, Blackhawk fan or not, I’ll have a two hearted. Much love for you guys. Been visiting your fine establishment since 2011 and drinking your fine beer before then. You have certainly had a part in revitalizing Michigan. Congrats to the new partnership! Michigan Only, Michigan Forever! LOL. Will you please ask Joe and the rest of the owners how much they hate that they took such a hard stance on something? Please ask them if they regret such a dumb tag line and if a tag line was worth losing so many fans for the bottom line? We’re sorry to have disappointed you, but in every decision we make, we’re thinking about our employees and our community. As you can imagine, a lot can happen in 13 years and as a business, we’re always evolving. We strive to be as open and honest with our fans as possible during times of chahttps://www.shortsbrewing.com/wp-admin/edit-comments.php?comment_status=moderated#comments-formnge. Please distribute to CO. Only getting your beer during GABF is really disappointing. Dearest Short’s Brewing. The bittersweet day of infamy has arrived. What was once a “Michigan Only, Michigan Forever” brewery has now headed down a path that true fans can not follow. My personal devotion to Short’s has faltered and I begin to realize that what lies at the bottom of such fruitless endeavors is based solely on money. Plain and simple, Short’s Brewing Company is now tied with Heineken. The core and lifeblood of Short’s was its unique identity, now it will soon be just another brick in the wall. So sad. I am nervous! I would be lying if I said it weren’t true. I hope Short’s stays true to themselves. Short’s is my favorite brewery. Lagunitas is okay, but…WOW I’m just nervous, please don’t change any of your recipes! Our beer recipes will not be changing and it will still be brewed by the same people who care so hard in Northern Michigan. We hope you’ll see our commitment to this in the months and years to come. Well since my original comment was deleted I guess I’ll just post a link to this and hope that doesn’t get deleted. Howie from Chi-town here…Just was in GR MI and stopped at Hop Cat there and had my 1st Huma…if Shorts joining with LUSH-Heinie means they will distribute in Chi-town, I am ready to enjoy…we have gr8 IPAs in Chi, but Huma is out of this world…so thx Shorts and thx MI for sharing! Thank you so much for the message. We’re stoked to hear how much you enjoyed your first pint of Huma. 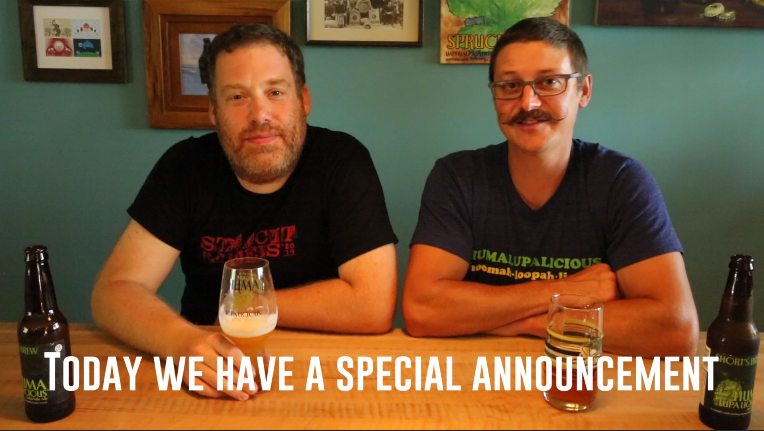 While we’re excited about the new opportunities our partnership with LUSH will bring, we’re even more excited to tell you that you can already find Huma Lupa Licious on tap and in bottles in Illinois. If you let us know which area of the city you’re located in, we’d be more than happy to help you find the nearest Huma. Will someone PLEASE respond with whether or not we sad sacks who had to leave Michigan and are stuck in California will be able to buy Shorts out here? The only MI beer I’ve found in NorCal on a regular basis is Founders, which I love, but the idea of having more is incredibly exciting. I can understand fans’ frustration of Shorts “selling out” but as a Michigander who’s far from home and just really wants a friggin’ Soft Parade, I’m pretty pumped. Thanks for the message! We have no plans to expand our distribution at this time, but we appreciate the sentiment. If we ever begin distribution in California, we’ll be sure to post about it on our social media channels. Hopstache was the beer brewed for Beer Liberator Woj’s 30th birthday party. Mustaches were mandatory at the party. For the occasion, Joe grew his first mustache ever; taking him three months. At the end of the party, Joe shaved his mustache and packaged it neatly into an envelope to give to Woj for his birthday present.